Go! Running Tours in Reykjavik are the quickest, healthiest and most fun way to discover this charming city. Reykjavik is on the up as a tourist destination, and it is small, so you can get around the main sights nice and quickly. Your running guide will be on hand to regale you with stories and answer any questions you may have. Choose a city run that hits the major sights, or venture off the beaten track to a beautiful coastal route. Whichever you choose, your flexible local guide will make it an experience to remember. Don’t forget to bring your phone with you to snap Iceland’s stunning nature. So don’t think twice. When you’re in the Icelandic capital, see it the smart way with Go! Running Tours in Reykjavik. Iceland is Europe‘s least densely populated country, and an island isolated from the rest of the world. 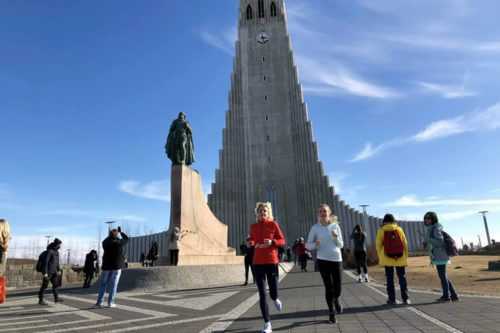 Because of its diminutive size, at just 125,000 people, our guided running tours in Reykjavik can show you all of the major sights in relatively little time. And as one of the cleanest, greenest, and safest cities in the world, it is a runner’s paradise. If the thought of running in Iceland already has you shivering, fear not! Icelandic summers are surprisingly mild and green, with nonstop daylight around midsummer thanks to the midnight sun phenomenon. In winter, the longer nights create ideal conditions for the northern lights. Runners rarely stay confined in one place. Our running tours in Reykjavik break out of the city and take the most popular running route in Iceland. While this route does include part of the city run, you’ll spend a lot of your time enjoying breathtaking coastal views and exploring Nautholsvik geothermal beach. For a small island, Iceland has produced many creative minds, and this creativity permeates all aspects of the capital. From the Reykjavík Art Museum and National Gallery and Marshall House to clever street art and installations, you get a real feeling of creativity everywhere you go. Hallgrímskirkja church is maybe the pinnacle of architecture in the city, and must be seen to be believed. The food scene is nothing to sniff at either. Discerning palates combine to create a scene that sees experimental Icelandic dishes sharing space with tapas restaurants and burger joints. So after your running tour in Reykjavik, you have a lot of choice for where to refuel. Pull on your trainers and join our running tours in Reykjavik.